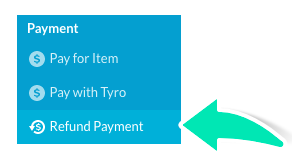 This article will show you how to instantly refund a HealthPoint payment which was made in error via the Tyro terminal. It is important to note that the refund can only be made within 24 hours from the time the payment was made. If the 24-hours time window is expired, you can process the refund manually using the Cash payment method. Please contact the private health organisation to submit a request to cancel the claim that was made. 1. Open up the invoice and tick the box for the line item that was made in error in the Items section of the invoice. 2. This will expand a menu on the right side of the invoice screen. Click on Refund Payment. 3. In the new window that appears, enter the information into the appropriate fields. Ensure that the Adjust Balance box is ticked and then click Save.